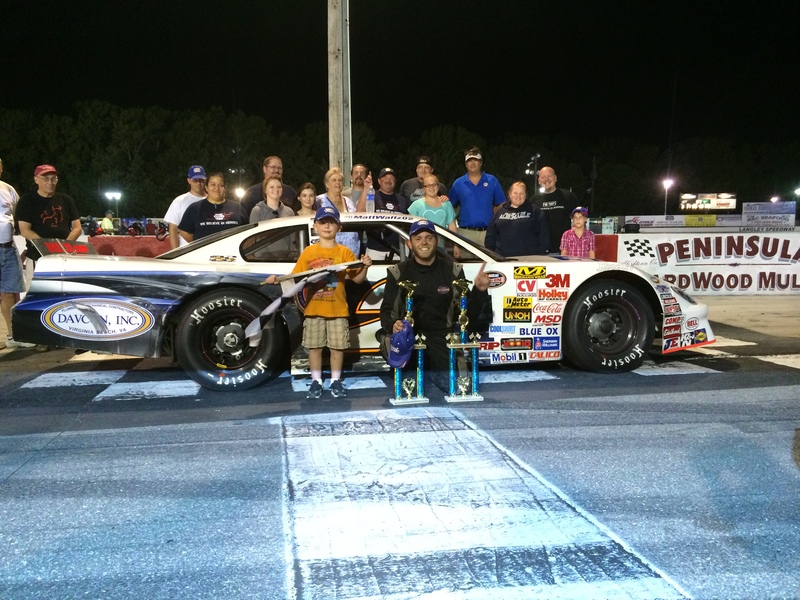 Hampton, Va – (8-23-14) As we reach the end of yet another interesting racing season at Langley Speedway, the Late Model Stock Cars took to the track for the fifth and fourth final races of their championship campaign. Greg Edwards entered the evening coming off a second place finish the previous weeks winner Matt Waltz, who by the way has been riding a hot streak since the events of the Hampton Heat. Waltz, who has the most wins on the season, entered the evening twenty-four points out of the lead with plans to make is case that he was not out of the hunt. Seventeen cars piled into the .395-mile flat oval this past Saturday for NAPA Auto Parts Night At The Races. Two new faces were among the entry list; Precision Performance Motorsports (PPM) driver trainee and rookie Cameron Bowmen not only made his Langley Speedway debut but also his first Late Model start. Spencer Gallagher, driver from the Lee Faulk stables, decided to try his might and one of the trickiest tracks on the east coast. Threat of rain in the area for the entire day created for cloudy and cooler conditions then weekends in the past, which means two things, strung out track officials and faster racecars! The first order of official business was qualifying time trials. Matt Waltz was the ninth car to take the track looking to grab the pole position but had his thunder stolen by “Quick” Nick Smith, Smith earned the pole in the first race on his fast time of 16.047 (88.615 mph). Waltz clocked a time just two thousandths of a second slower than Smith and would start on the outside of row one for race one. All seventeen drivers would have to fight for sixty-four laps to earn their spot in the second race. When the green flag dropped over race one Smith and Waltz wasted no time fighting for the top spot, Smith on the low side while Matt Waltz took up residence in a very familiar top groove. It only took four laps for Waltz to secure the number one spot on the track. The next few laps Smith would attempt to stick his nose to the inside of Waltz but was not able to make anything work as the 2 car was just so strong on the outside. Further back in the pack we saw some good racing between young rookie Connor Hall and Casey Wyatt but that would have to be put on hold as the nights first caution flag waved. A solo spin from Cameron Bowen in turns three and four, a slow spin with no damage allowed for Bowen to return to the field and brought out the Krispy Kreme cone. Waltz took the restart on the outside with Nick Smith back to his inside. As the green flag dropped Smith was able to hang tough down to the inside while Queen and Greg Edwards battled it out for the third spot on the track. The unconditional lead was handed back over to Waltz by lap sixteen and the two started to open up about a five-car lead over Greg Edwards. You had to look about ten car lengths back to find the duo of Wertz and Queen who spent a good amount of laps door to door trying to secure a top five spot. Just as the race reached the halfway mark Nick Smith took one more stab at the inside of Matt’s car putting some serious pressure on the leaders, this allowed for Edwards to catch back up. It did not take long for Smith to back off the assault as Waltz was on rails on the outside groove. Not to mention Edwards started making his own case for the second spot which he would take with less than twelve laps to go. The race saw only its second caution of the night when Bruce Livingston was way off the pace down the front stretch in what was actually a pretty scary moment! Brenden Queen and Connor Hall had to take some evasive actions and split the dead car to avoid creating an even worse incident. The top five, made up of Matt Waltz, Greg Edwards, Nick Smith, Mark Wertz, and Michael Hardin who was having a stand-out night showing that he is starting to figure this place out, took the green flag on lap 61 setting up a four lap dash to the finish. Waltz was able to make pretty quick work of the field with the help of Smith and Edwards battling it out for the second spot. Smith was able to rally his car back around Edwards finishing the first race in the second spot and pretty much insuring the inside line on the start of race number two. Edwards, Wertz, and Queen were all scored as your top five finishers from race number one. Only a handful of supporting divisions separated us from race number two and it didn’t even take the green flag to wave for some crazy drama to unfold. As Edwards pulled his car to down pit road and into his pit stall the crew immediately went to work getting tire pressures as the usual at the end of every race. What crew members were not expecting to find was a hole in the right rear tire of the 97.3 The Eagle machine. Due to the fact Edwards would not start the second race on all four tires he ran on in the first race, he would have to go to the rear of the field. Once the tower got the line up where it needed to be Waltz elected to start on the outside leaving Smith on the bottom of the track. Behind them were the machines of Queen, Wertz, and Hall in that order. Two cars were not able to roll off for race two, Livingston who broke something during the first feature and Duance Shreeves who was not able to get his machined fired. When the field took the green flag Waltz jumped out to a pretty sizable lead over the field as this was the type of break he needed to make up any championship points. Eight car lengths was the distance between the leader and second place early in this one. Because of Edwards starting in the rear there was nowhere near the amount of side-by-side racing towards the front of the field but there was plenty in the middle. Edwards was certainly the man to watch during the second race, having to battle back from a sixteenth starting spot. Edwards was not the only man on a machine, Brandon Gdovic seemed to make the right adjustments for the second race allowing him to make some pretty hard charges towards the front. Three separate battles for position got under way just before the half way point of this race, Queen and Hardin spent quite a few laps door to door fighting for the fourth position on the track. Right behind them were the machines of Connor Hall and Brandon Gdovic working on each other to secure the sixth spot in the field, and just behind them Greg Edwards was putting pressure on the 92 machine of Wyatt as he tried to work his way back to the front of the pack. The field spent quite a bit of time ticking off green flag laps, Smith had decided to try running the high line along with Waltz right before the race saw its first caution, another solo spin from rookie Cameron Bowen into turn three. A huge break for Greg Edwards as it not only bunched the field up but allowed for him to take the cone and cool down his tires. On the ensuing restart Michael Hardin appeared to have trouble getting back up to speed causing some interesting work deep in the field. By the time the field reached turn four we were under our second caution of the race for the spin of Evan Horne. With the final restart on the night Mark Wertz in my opinion got the restart of his life but then looked like he just fell off. Waltz and Smith were rolling the high line with Wertz battling hard bellow them, Waltz was holding on to the lead for dear life! Granted Nick Smith and Mark Wertz fought a very tough battle it was not enough to take away the twelfth win away from Matt Waltz. Nick Smith, Mark Wertz, Brandon Gdovic, with the help of the late cone, and Brenden Queen were your top five finishers. The Late Models will have the next weekend off as the Whelen Southern Modified roll through town, returning to the speedway September 13th for another set of Twin 64 lap races. 17. #26 Danny Edwards, Jr.
8. #26 Danny Edwards, Jr.
Tyler Stallings started on the pole for the night’s first feature – a 20 lap race for the Rhonda Claiborne Pro Winged Champ Karts, to his outside Amanda Frye. At the drop of the green flag Frye did not get a very good start, which allowed Stallings who was being pushed by Angela-Marie Steele to secure the lead. There actions would be halted however when the 45 of John Savage went for a spin in turn four, collecting the karts of Jordan Valdes, Charlie-Ray Lorah, and Jonathan Mullet. On the second attempt to get things underway Stallings and Steele picked up Josh Ayre and decided to turn up the heat and took off. Things went pretty smooth from that point on but in the mirror of the lead pack was about five to six cars running them down. With five laps to go the hard charging pack was split up which sealed the deal for rookie Tyler Stallings to capture his first win, in impressive fashion might I add. The Bandolero division was next to run for their 15-lap feature where Trevor Wells not only captured the win but had his trophy served to him from NASCAR Nationwide points leader, Chase Elliot. The only caution for these young drivers was when the #87 of Aidan Bolling came to a halt on the backstretch; his tire on the other hand had other plans and kept going into turn three. Leader Devon Courtney was somehow spun around under caution. Giving a break to the young ones, Courtney was allowed to rejoin the field no harm done to anyone else. Wells made his pass for the lead on the white flag lap and was able to hod on to the win. Justin Fuller remained the man to beat qualifying on the pole yet again but spun the wheel and inverted the top six. Courtney Shiflett was able to lead the field down into turn one but her efforts were brought to a halt when Thomas Gildea went for a ride through turn two. On the ensuing restart Shiflett did again what we are so familiar with seeing, she missed a shift or something and by turn one was dead last on the field. Fuller would go on the assault to work his way back to familiar territory. The night’s second caution came from the spin of Ashten Mullett. Unable to retire the machine safety crews arrived to find fluid leaking creating red flag conditions. After a brief break in the action Justin Fuller was able to power around Schaffer who had one hell of a save in turns three and four after to keep his car in one piece. Landon Abbott was the fast qualifier for the 40-lap Butterfoss & Barton Orthodontic Super Street division. Abbott led flag to flag and picked up his second victory on the season. The top five spent pretty much the entire race beating and banging trying to muscle past each other. In an event that saw just one caution Abbott was able to handle the restart and regain about a full straightaway over Reno Marchetti. Sammy Gait, John Pereira, Sean Calway rounded out your top five. The INEX Legends were in town for 25 laps where a tight point race between Tommy Jackson, Jr & Brandon Gdovic. 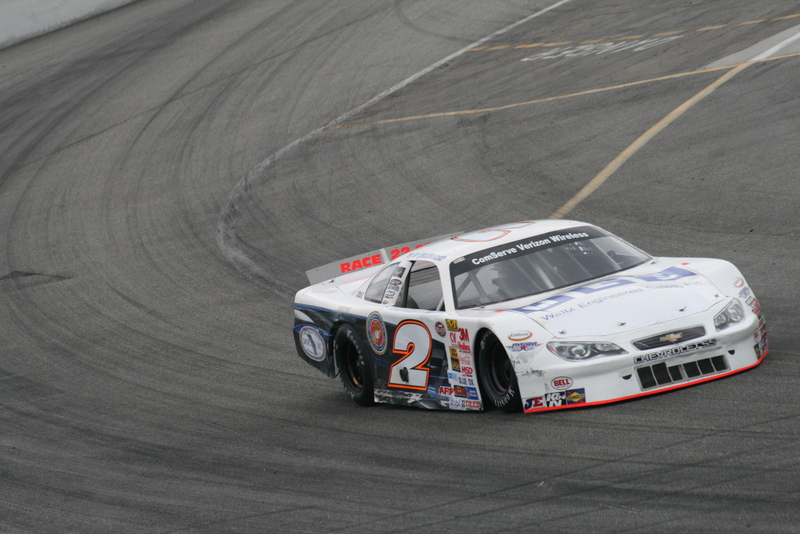 Only five cars took the green flag on the evening where Jackson was the fast qualifier. Just two laps in Jackson surrendered the lead to Saunders with Chris Hildebrand in toe. Saunders and Hildebrand would spend the next few laps within close proximity of each other until Hildebrand took over the top spot on lap 17 and cruise to yet another victory. Behind them Gdovic & Jackson would battle all the way down to the line where Gdovic would edge ahead of Jackson to claim the third spot and take over the points lead.